Ah the first update of 2018 is upon us! 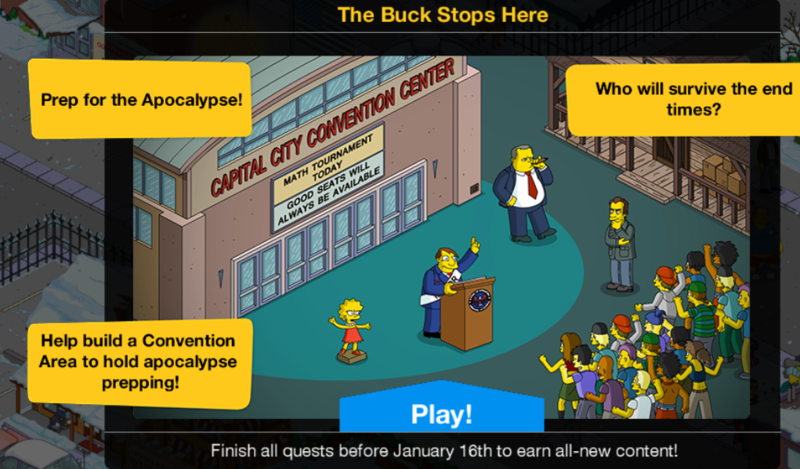 Yesterday several little updates collided into one…topped off with a brand new mini event, The Buck Stops Here! And that’s it my friends! All there is to the Buck Stops Here mini event main questline. What are your thoughts on the Buck Stops Here Mini Event? Any prizes you’re looking forward to getting? Plans to design a Capital City area of Springfield? Sound off in the comments below, you know we love hearing from you! 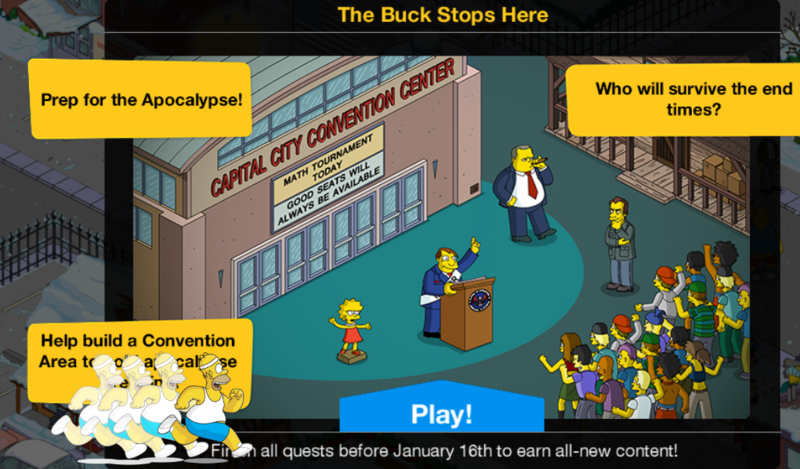 This entry was posted in Buck Stops Here, Tips and Tricks, Updates and tagged Buck Stops Here Questline, How do I get Birch Barlow, How do I get Capital City Convention, how do I get Capital City Plaza Hotel, Tapped Out Mini Event, Tapped Out Tips and Tricks, The Simpsons Tapped Out, TSTO Addicts, TSTO buck stops here event, TSTO political Event, TSTO Tips and Tricks, Wel-Scare State Questline. Bookmark the permalink. Google took me here as I was looking for how to start the “tend dubious plant” quest for Mayor Quimby. It doesn’t say I need a building or anything just says quest. So trying to figure it all out. Is there a post with the dialogue for this event? My sis was away and i started the event for her on her game, but forgot to screenshot the dialogue for her. Doh! We’ll have it up in due time. What is with all of the updates and why are they taking forever. 2 updates dropped today in my device. The first one took 6 hours to download and the 2nd is still going. I’m half tempted to delete my game all together (and maybe give it up all together). Anyone else having update issues? Newer phone, game on the SD card??? My game is updating about twice a day. I’ve tried everything to get it to stop. I have 4 GB of free space on my iPhone. Nothing I can do about it. It is annoying. But mine only takes maybe 15 minutes to update. It does make me play less often if I don’t have time to wait for the updates. I desperately need MORE LAND with this event – more government buildings is going to require some major renovations. Do they purposely use the recycling plant characters for these event quests? I typically get 15 donuts a day from recycling but these events are killing me! How are you managing to get 15 donuts a day from recycling?? My partner is level 15 and i have checked her Simpsons, her app store but she has not had the update. Can anyone advise please. All her characters are available but still nothing also uninstalled and re installed Simpsons again no update. Even if you tap like crazy, KEM farm or use the collider (may not come until later levels anyway) to level up quickly you’d still need to complete the previous level quests to trigger the unlock for the town hall. I actually like those because you can send pretty much anyone and you only need 5-10 people. Just get rid of everyone you need for other tasks, like recycling or other quests, and then send characters you never use on those Make Sprinfielders… tasks. They are also good when you send everyone and they are done you can find them all in the same spot rather than roaming around your town looking for the finished tasks. The problem is that anyone with a premium costume gets set back to their default, so you either have to exclude them and manually send them on tasks, or find them and set them back after. Either way takes time. It’s especially annoying when the task is 4 hours long and you were about to send everyone on their 8 hour task before going to bed. To be able to send any characters recycling… I can’t keep dividing them between events, episode tie-ins, and recycling. Not sure if this was covered, but i started KEM farming yesterday and I don’t get the 220 KEMs to start with anymore, I just get all 14400 KEMs. Anybody else? Check your inventory. More than likely you hit “store” instead of “sell”. It should start at $220 if you only own 1 KEM. I find it annoying that Lisa is required for both Buck Stops Here and STEM Vs. Them quests. I have to keep juggling what she’s doing so the two quest lines don’t get stalled for too long. Getting number 1and 51 so I will have 90 donuts left should I save or spend? Number 51 is a full, premium, character for 10 donuts NET. No brainer. It’s a “rebate”, so you do need the 100 to spend to start. But – full premium character for 10 donuts? No brainer! The tunnels are so big. I have no use for them. What do you do with these oversized tunnels? Do the tunnels have a teleport feature like Moe’s Brewing Company? If so I may acquire some – love my teleporters and could use more! Yes they do. If you build one then tap it, it transports you to the original, but it’s only one way travel. 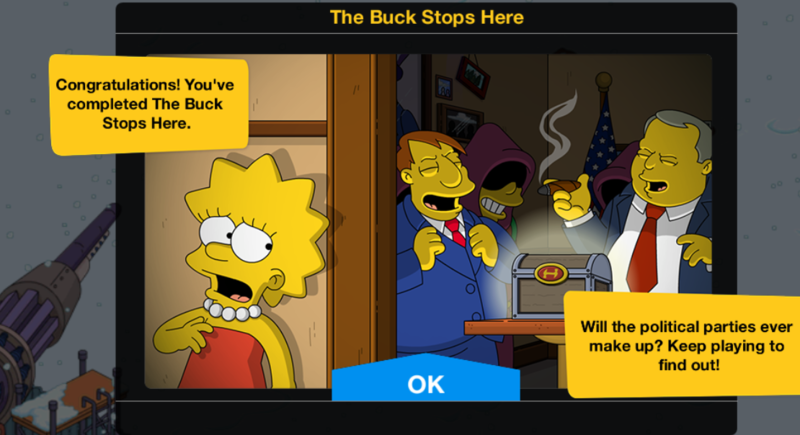 When I sent all my Springfielders to Prep for the Conserva-lyspe, I noticed the characters introduced during the Spy and Music events still are not included (ditto the Halloween 2017 characters). Yet characters from the Pride and Beauty Queen mini events as well the Xmas characters are included (and all those events occurred after the Spy event). Alaska Nebraksa and Adil also do not have the usual kid tasks of eating ice cream or going to the movies. It’s like EA completely forgot to add these characters to the Springfielders group. You say that like it’s a bad thing. I have over 150 characters, and whenever I get a bulk “Make/Send Springfielders…” task, it’s a real grind. I wish EA could program it so that if you only need to send 5 or 10 Springfielders on these bulk tasks, you can just pick 5 or 10, and then the rest of the characters can be sent on their normal tasks via the Unemployment Office. Or a “send all” button, but yeah to a counter so if you send the right amount it stops the rest from being locked to the task so the unemployment office actually helps. I’m one of those players that started a few years ago after the initial stonecutters events. As such I’ve never had a shot at the lodge or all the skins. So here it is and I only have enough doughnuts for either the skins OTr the lodge. Are the skins useless without the lodge? Am I best to get the lodge first? Thanks! I mean character COSTUMES you barely see. I’d always grab a full character over a building… but costumes are usually meh. I couldn’t pass up 10 doughnut ones though! Most of the stonecutters jobs are at the lodge. I would opt for lodge first followed by as many skins you can get on top. I bought all the skins and ended up with 15 new quests!!!! Fortunately there were all a single 4 hour quest. The lodge gives you number 1 as a character and also the building, when you complete his latte task (Springfield heights required) you will be rewarded with homers stonecutter skin. I also highly recommend you get number 51 (the little alien dude) he is a full character for only a net of 10 donuts, although you need 100 to buy him, you will get 90 rebate immediately after purchasing him. I don’t have the answers for the rest. Happy tapping! I already had both the Lodge and No.1, but I never got the Homer skin. Does anyone have the same problem, or know how to kick start the task that will get the Homer skin? If you farm donuts these skins turn normal characters into premium increasing your collection rate. That amount of cash and money adds up over time. It also looks like the Movementarians have come to town! Here’s irony for you. I started because you could play 100% freemium and would gaze longingly at premium items rarely having built up enough from daily tasks and mini games. Spending real cash would take days of consideration and was usually ruled out. A little while ago I finally understood KEM farming and had enough of a town to give it a go, getting 12m XP on a full days play and making wish lists for what was in store. Sometimes I’d miss a bit of tapping time or have a run of 2 bonuts time and again, not wanting to gamble and drop to only 1 I’d take them. As a result I’d sometimes find myself somewhat short for the wishlist and go getting sprinkles to be sure. Since I started KEM farming I’ve spent around 10 times as much as I did in the first 90% of game-time, and now I’m seriously considering a batch of 900 having used all my farmed donuts and the store bought top up on Christmas stuff. So the irony, I start KEM farming for free donuts and then spend an awful lot more real world cash as I crave extra sprinkles?!! I think that’s the intention with giving us so many ways to earn doughnuts. If you have to wait a week to get 1 or 2 then you’re going to be miserly with them or just blank out the premium items from your mind as you know you can’t buy them without real cash. For me the real dollar to doughnut value was always quite poor, so the temptation to spend real money is still quite low… I haven’t crossed over to being a paying customer but thanks to farming I tend to buy a lot of the main premium items for events. I usually hate Mystery Boxes in other games, but I’ve been buying every single item in them for the past 6 months as they offer a lot of items I could never afford before farming. I still weigh up my doughnut purchases though, and I skip anything I don’t like or I think is overpriced (Jesus from the Xmas event fell into both categories lol). Don’t do it at the expense of paying bills or buying groceries etc. Budget yourself (at the low number you calculate) that way you can see if you have any spare money left over to treat yourself to some in game donuts, otherwise don’t do it. Take care of all your real life needs first. Got the monorail yard and Jesse Grass, but most of the trades so far involve metal and most of the “staff” for that are tied with the event so not yet got 2 track pieces on todays run !! Maxed out on plastic and glass if I get chance to trade, plEAse !! Depends how you play, I’ve got a few hundred assorted houses including about 100 brown to add income to fund KEM farming. If I get them early on then by the time I’ve tapped the rest and sorted tasks I’ll get another hit of cash, then back in around an hour for another claim or two. If you’re on 4 hour cycles or even 8 then blue or white houses make more sense ( got 100’s of those too) or even the expensive gulp n blows for a 4 hour payout. KEMs give huge amounts of XP meaning you level up quicker and get free donuts, but don’t make my early mistake and keep them for income. The more you build of anything the more they cost, but sell KEMs for 1/4 cost and the price goes back down. Thank You for the reply. I highly appreciate all the above advice. Salutes! Pretty much me, but havent KEM farmed as of now. That last comic makes it sound like this is a little set up for a massive event. I don’t know if it will be stonecutter centered but it could be.